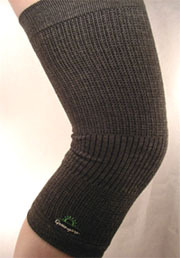 Greenyarn knee guards feature fine gauge densely knitted 200 needle count knitting and our trademark Eco-fabric. Greenyarn knee guards are comfortable to wear and does not restrict blood flow. They containing a high percentage of Eco-fabric. They are anti-bacterial, anti-fungal, deodorizing, absorbs and emits far-infrared radiation, thermal regulating, prevents static build up. Far infrared radiation can improve blood circulation and help metabolism. Featuring fine gauge 200 needle count stitching, these products have towel like comfort that absorb and disperses sweat fast. Many who use these knee guards wear them at work as they protect the knees, keeping skin temperature stable, hence preventing rough and course knees. They also help relax the joints and keep the joints warm. The other users of these socks include the people who suffer from joint pains, as these knee guards are known to reduce the arthritis and other joint pains significantly. To prevent constriction of blood flow and different zones of the knee guards were knitted with specific compression and we only use Lycra for elasticity. Hence wearing these knee guards will not leave behind stretch marks which is also a main source of discomfort. The knee guard is neoprene free and moisture wicking, so it is breathable and this means it doesn't get hot, sweaty and uncomfortable during sports. Lightweight Polymer spring braces are embedded to the sides of the knee guards to make sure the knee guards stay in the right position. The circular visco-elastic TPU gel with moisture wicking fabric that surrounds the patella provides added passive support to the knee. The knee guards also provide protection, balance and enhance comfort. All the benefits are carefully designed while keeping the knee guards relatively low profile. • Additional support for weak knees. • Provides stability and relieves pain of osteoarthritis. • For all knee ligament and cartilage injuries and knee arthritis. • Breathable fabric makes it perfect for sports and skiing.